Halve the above recipe to accommodate the size of most double boilers: Combine 4 cups water, 1 cup steel-cut oats, 3 tablespoons dried cranberries, 3 tablespoons dried apricots and ⅛ teaspoon salt in the top of a double boiler. Cover and cook over boiling water for about 1½ hours, checking the water level in the bottom of the double boiler from time to time. Ingredient Note: Steel-cut oats, sometimes labeled “Irish oatmeal,” look like small pebbles. They are toasted oat groats—the oat kernel that has been removed from the husk—that have been cut in 2 or 3 pieces. 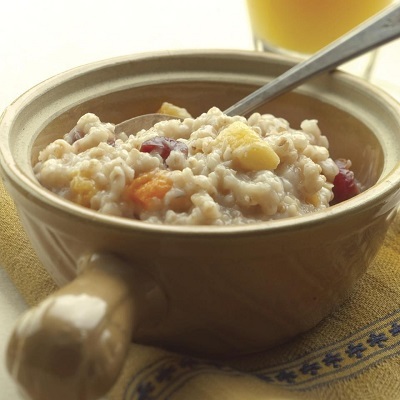 Do not substitute regular rolled oats, which have a shorter cooking time, in the slow-cooker oatmeal recipe.